Grow Zone Recommendation: Lavender is a perennial shrub and herb that grows well in USDA zones 5 to 10. Sunlight Needs: For proper growing, lavender prefers to be planted in full sun. Watering Needs: Water your lavender plants regularly early on, until established. After that, they need little water — just when very dry. They are very drought tolerant. Average Size: Lavender plants grow from 1 to 3 feet wide and 1 to 3 feet tall. Foliage Color: The foliage of lavender is a silvery green. The flowers, which appear in summer and are known to last all season, are a light purple-blue. Must Know Plant Care Tips: For cut flowers, gather the blossoms right after they open. Provide sunny conditions, warm temperatures, and well-drained soil. Alkaline soil is best. Lavender does not tolerate too much moisture, so consider location carefully. Can be prone to root rot if too much moisture is present. Space plants far enough apart to provide adequate air circulation. Prune regularly when blooms are spent to keep them looking neat, and you’ll encourage new growth. Plant Problem Solver: Lavender is deer resistant, very drought tolerant, and great for erosion control on a slope. It also makes great ground cover and attracts birds. It is highly fragrant and grows well in containers in a sunny spot with good drainage. Pretty Pairings: Great companions for lavender include aster, echinacea, wild indigo, sedum, baby’s breath, and drought-tolerant varieties of roses. 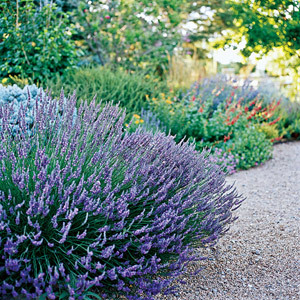 Plant lavender with other drought-tolerant plants for a water-wise garden that looks and smells fantastic.